Belgian style beers can be a drastic change from the typical American-style watery lagers that sooooo many people seem to enjoy (or at least chug down while watching sports). Even though they are virtually made with the same basic ingredients, they are oh so different. Anderson Valley Brewing Company out of Boonville, California make their version of a Belgian tripel, a style of Trappist beer made with triple the amount of malt, hence the name. Yeah, I know, it's not a very clever name, but Belgians don't care about being clever. They care about making tasty beer. 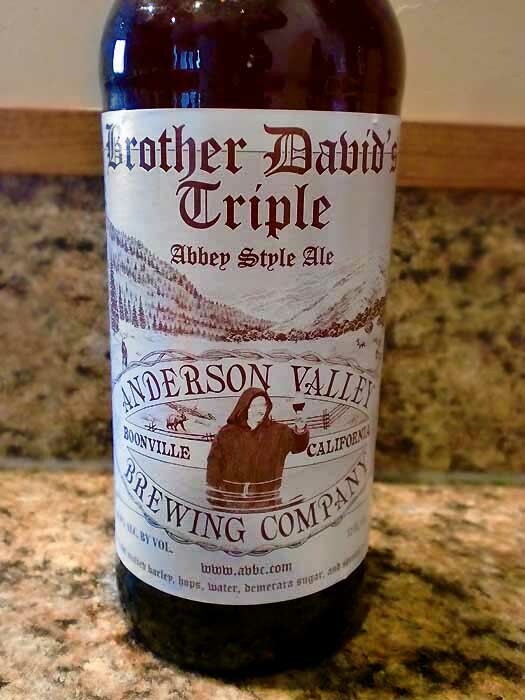 This tripel is named after David Keene, the owner of the Tornado Pub in California, and that's him there on the label looking at his glorious glass of brew while dressed as a monk. Apparently this guy really loves Belgian brews. Go figure. Brother David's Triple pours a murky orange color. It explodes with in-your-face aromas of banana, oranges, honey, clove, sweet malts, and some yeasty bread. When I say the aromas explode, I mean it. This brew has a ridiculously strong aroma, with the sweet scents typical of Belgian yeast, but maybe even more so than one would expect. You take a sip and get overtly sweet toasted malts, candy sugar, and caramel followed by a mild touch of hops and more of the spices detected in the nose. The impressive 10% alcohol stays fairly hidden, all things considered, but it's likely just hiding behind all the sweetness and over-the-top flavors. This brew is much sweeter than I'm used to with all the Stouts and IPA's I drink, and it's actually sweeter than most authentic Belgian beers I've had. There's little in the way of finesse here, as this is obviously an Americanized Belgian style beer with strong upfront flavors. This isn't the kind of beer I want to drink everyday, but damn if your tastebuds won't want to be blown away every once in awhile. It's strong and tasty in an odd, odd way. This is kind of like a dog that's so ugly it's cute. So, even though it's unbalanced and really not my style, every now and then I crave another one... and it's kind of weirding me out. Drink This: if you want an in-your-face Belgian style Tripel that's made in California. Don't Drink This: if you don't like flavor and lots of it. Or if you don't like sweet beers because this big boy is sweeeeeeet.